MANILA, Philippines- Netizens are enraged over a series of videos of a male passenger verbally abusing a female passenger inside an FX. The controversial videos, shared by a certain Soy Gonzales on Facebook, has quickly gone viral amassing over 200,000 shares as of this writing. In the video, a man was seen cussing and shouting at a female student inside an FX. According to Gonzales, the man, who was with his wife during the incident, shouted at the student because she was apparently blocking his way. In the first video posted, the two were seen engaging in a heated argument inside the FX. While the student tried to calmly discuss the issue with him, the male passenger was heard cursing the student several times. The second video apparently shows the heated exchange between the two after the male passenger and his wife alighted the FX. The man, who was still shouting and saying cuss words to the student, was repeatedly heard saying that he is dealing with a big problem. WARNING: Videos contain some foul words. Although it wasn’t captured in the video, Gonzales claimed that the man punched the student on her shoulders before alighting the vehicle. 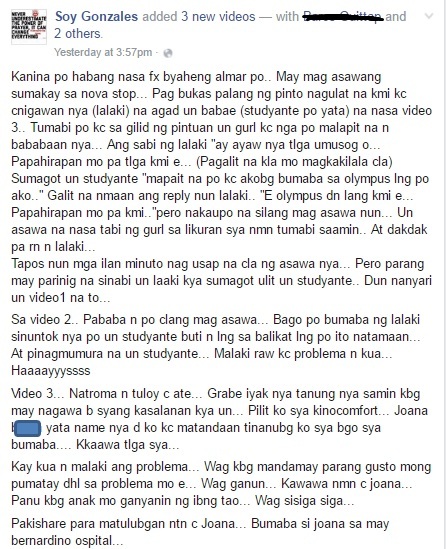 Traumatized by the incident, the student was seen helplessly crying in the third video. Gonzales was heard trying to comfort the victim she identified as Joana. The viral video has been instrumental in tracking the abusive man in the video. 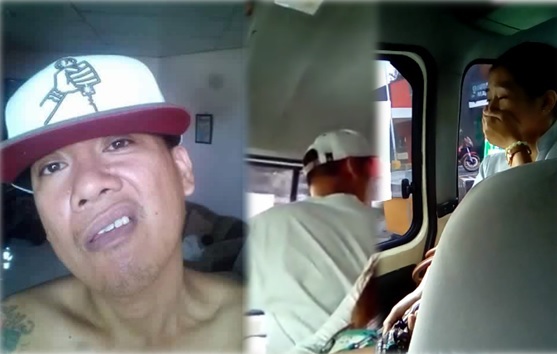 Several netizens positively identified the man in the video as Mike M. Arellano. In a post shared by the Facebook page Social Trends PH, it was revealed that the police were able to track Arellano’s location with the help of some netizens. Several photos of the alleged capture of Arellano were shared on the page. As of this writing, Arellano hasn’t issued a statement regarding the incident.